Preheat oven to 375°F. 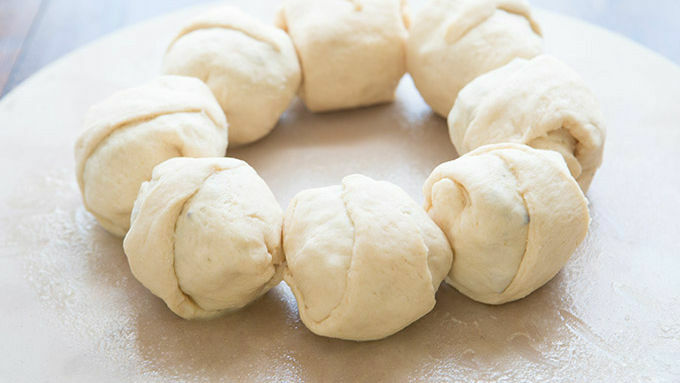 Open Pillsbury™ crescent rolls, unroll and separate individual triangles. 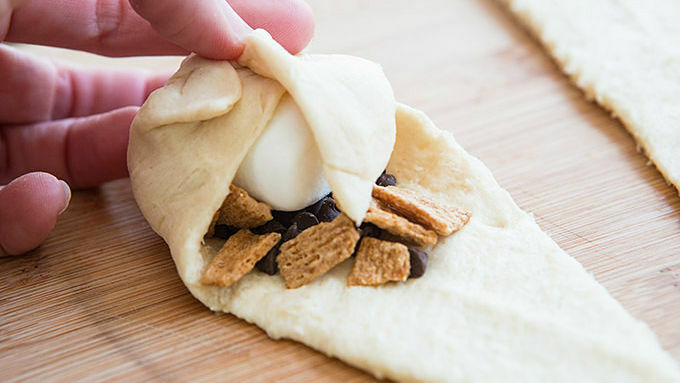 Fill the large end of each triangle with 2 tablespoons chocolate chips, 2 tablespoons crushed Golden Grahams™, and 1 large marshmallow. Fold the ends of the triangle in to the center, and roll the crescent around the marshmallow, completely covering the marshmallow and pinching the edges together to seal completely. Place on a lightly greased round baking stone. Repeat with remaining triangles. Bake for 12-17 minutes, or until the crescents turn a medium golden brown. Remove from the oven and drizzle with hot fudge sauce. 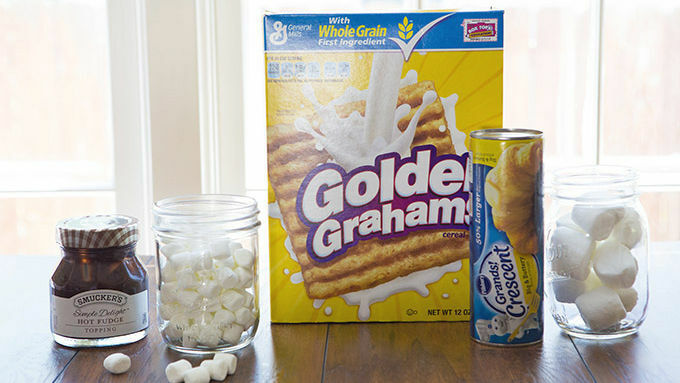 Sprinkle with mini marshmallows and Golden Grahams™ cereal. Serve with extra hot fudge for dipping, if desired. 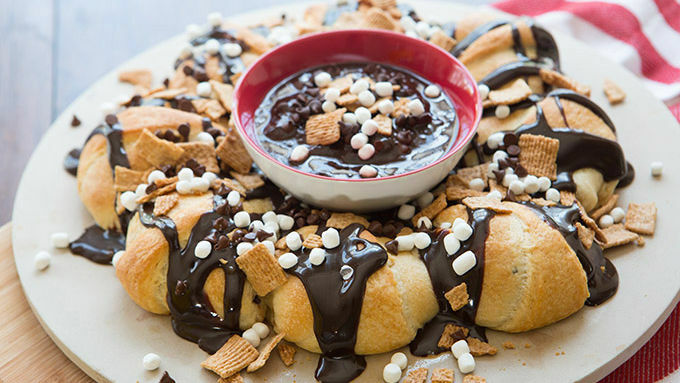 You just need to say the words S’mores Party Ring to watch people melt. You’ve thrown parties. You know how to please people. You know how to make Pinteresty stuff that wows and all. But that was BEFORE. Like, way before this S’mores Party Ring ever existed. Way back when this idea was just an uninvented star in the sky. And then. BLAMMO! S’MORES PARTY RING! And suddenly, you’re not just throwing parties. You are ROCKING parties. 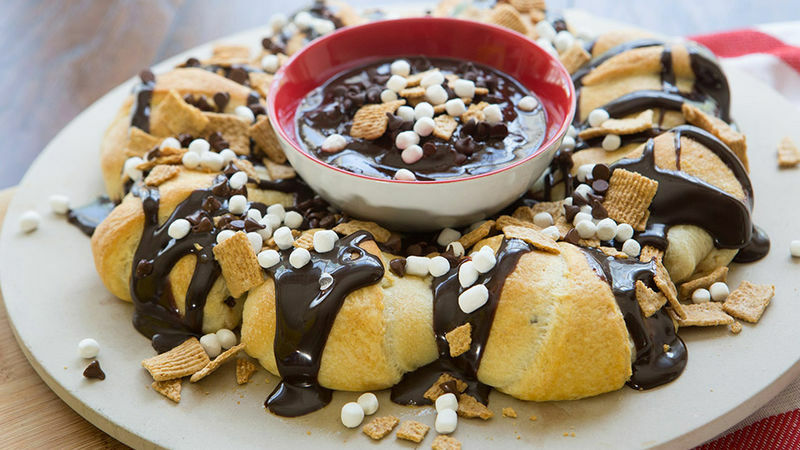 You are showing up with le S’mores Party Ring and a pair of sunglasses and people are all, like, vying for your attention and begging for you to sign their shirts with hot fudge sauce. The fame looks good on you. The world is better because of you. People are pleased to the tees and begging for s’more of you. And life gets just a little more chocolately, a little more marshmallowy, and a whole lot more Golden Grahamy. How nice is it to be the maker of the first ever S’mores Party Ring? We’d tell ya but are too busy fighting off paparazzi and swimming in chocolate. We can’t wait to share this recipe with you. If you desireth additional chocolate dipping sauce, place a bowl in the center of your ring and fill ‘er up with some serious hot fudge sauce. Lay your plate out for the world to see and prepare for the mobbing. This recipe is about to make you sooo famous, people won’t be able to keep their hands off you—er—off your S’mores Party Ring. Or… you know. All of the above.